Somehow it has ended up that I am the designated keeper of the family calendar. From parties to paediatric appointments I am the one who has to juggle everything so everything runs as smoothly as it can in our larger than average family. This would be fine if I wasn't so flipping busy that I forget to add things to the calendar. Creating a nightmare scenario of often trying to be in three places at once as I discover I have not just double, but triple booked myself. Decades ago when my jackets had shoulder pads and my uterus had not yet grown any humans and I still believed I might be one of those super efficient organised people, I bought an actual Filofax. A large textured brown leather one. I dutifully filled in all the contacts, added birthdays and inserted a crisp new diary pack. The whole thing seemed eye-waveringly expensive on a trainee journalist's pay . I always forgot to use it as anything more than a bulky leather-scented address book. Most of the diary pages were ripped out as I scrawled phone numbers, shopping lists and notes on the still virgin-white pages. 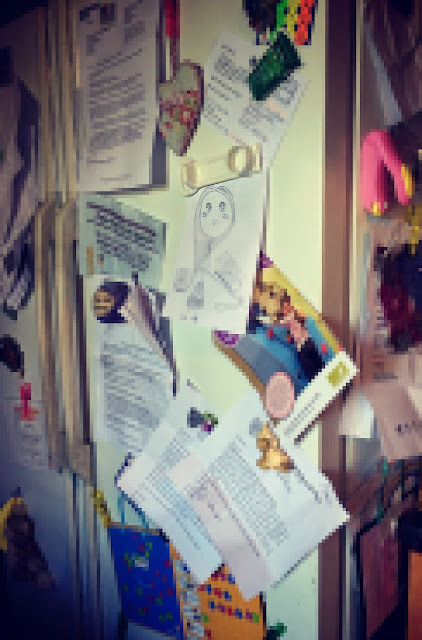 As the number of children falling out of me increased, my interest in the Filofax and office-style organisation faded to be replaced by the mum staple - the fridge door and a load of magnets of varying magnetism. I figure if I don't have time to read the guide, I probably don't have time to keep a bullet journal. So, I rely on my trusty smart phone with a calendar which is supposedly synced to my husband's. At a glance I can see what hours he is scheduled to work, and when he has ignored my requests to "not agree to work past 6pm as I have to go out and I need you to pick up/drop off a child or three." The synced calendar idea is a good one in principle. Apart from the fact you have to have time to fill it and check it every now and again. My problem is not putting in things that are what we used to call "pencilled in". Arrangements that have not been confirmed. So for instance this week I booked an optician appointment for one child in Hertfordshire at a time I may have to be picking up another (adult) child in Hampshire. Oops! I also still stick to the fridge door method of organisation and then forget to add the fridge letter details to my phone planner. And there really is no hope for the arrangements I made on the school run which are stored in my outdated and frankly almost obsolete skull-based storage device. Yes I'll pick your child up, yes I'll pass that message on. Except those arrangements may well be lost albeit temporarily in the whirling masses of useless information in my head and it's a lottery if I remember them at the right time. My next job after writing this is to email someone I had a street-based conversation with on Monday. I was tired and stressed and did warn the person I was overloaded but now have to admit to her that I simply cannot remember a single thing she told me and asked me to pass on. Argh! That's simple but effective! Thanks! All I can say is if you find a scheme please let us other mum dads carers and everyone know ha ha. I'll stick with the family calendar, fridge doors and pot luck until then. I will But I think it's unlikely.